Trip to Golden ring. Tour to the cities of Russia. Trip to Russia. Legendary tour. Sergiev-Posad (formerly Zagorsk) is located 71 km from Moscow. The town was founded in the 14th century by the Saint Sergy Radonezhsky who was canonized by the Russian Orthodox Church. The heart of the first settlement was the Trinity Monastery - one of the largest founded in Russia in the 14th to 15th centuries. In 1774, the monastery was given the title Lavra, i.e. a monastery of the highest rank. 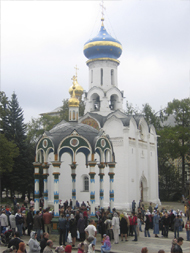 The Trinity Sergiev Monastery played an important role in the development of Russian history and culture. Due to its wealth, the monastery could afford to invite the best architects and icon-painters to construct and decorate the buildings. The monastery bought, and was given as gifts, a lot of fine objects of art and crafts. The best of these are now on display in the museum which is on the grounds of the monastery. On the grounds of the Trinity Sergiev Monastery there is a museum which was founded in 1920. Ancient Russian art of the 14th to 17th centuries, embroidery, gold and silver work and masterpieces of ancient icon painting are on display in the museum. In Soviet times, the Monastery used to be the official residence of the Patriarch of All Russia and is considered a Mecca for Russian Orthodox Church goers. Entry to the grounds is free. There are additional charges to visit the museums inside or walk along the walls. Devout female visitors always wear headscarves, and all men should remove hats in the churches. TRINITY CATHEDRAL (1422-1423). This squat, dark yet beautiful church (Troitsky sobor) is the heart of the Trinity monastery - and in its way the heart of Russian Orthodoxy. A memorial service for St. Sergius (whose tomb stands in the south-east corner, with people lining up to light candles in front of it) goes on all day, every day, lit only by oil lamps. Most of the icons are by the great medieval painter Andrey Rublyov and his disciples, though Rublyov's masterpiece icon of the Old Testament Trinity, to the right of the center of the iconostasis, is a copy, the original being in Moscow's Tretyakov Gallery. 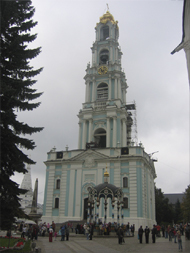 CATHEDRAL OF THE ASSUMPTION (1558-1585). This cathedral (Uspensky Sobor), with its star-spangled domes, was modeled on the cathedral of the same name in the Moscow Kremlin. It was finished in 1585 with money left by Ivan the Terrible in a fit of remorse for killing his son. Services are held here in summer but outside service times you may find it closed. Outside the west door is the grave of Boris Godunov, the only tsar not buried in the Moscow Kremlin or St Petersburg's SS Peter & Paul Cathedral. Nearby, the resplendent Chapel-at-the-Well (Nadkladeznaya chasovnya) was built over a spring said to have appeared during the Polish siege. REFECTORY CHURCH OF ST. SERGIUS. The huge block with the 'wallpaper' paint job and lavish interior (Trapeznaya tserkov Sv. Sergia) was once a dining hall for pilgrims. Now it's the Assumption Cathedral's winter counterpart, with morning services in cold weather. The green building next door is the metropolitan's residence. Church of the Descent of the Holy Spirit. This little 15th century church (Dukhovskaya tserkov), with the bell tower under its dome, is a graceful imitation of Trinity Cathedral. It's used only on special occasions. It contains, among other things, the grave of the first Bishop of Alaska. BELL TOWER. This five tier baroque wedding cake took 30 years to build in the 18th century, and once had 40 bells. TSAR'S CHAMBERS. The 17th century royal palaces (Tsarskie palaty) at the northern end of the monastery complex are now part of an Ecclesiastical Academy. MUSEUMS. The Old Russian Applied Art Section (Otdel Drevnerusskogo prikladnogo iskusstva), in the vestry behind the Trinity Cathedral, is in fact the monastery's extraordinarily rich treasury, bulging with 600 years of donations by the rich and powerful - tapestries, jewel-encrusted vestments, solid gold chalices and more. THE ART MUSEUM (Khudozhestvenny muzey) has icons and paintings from the 14th century on, and folk art (old wood-carvings, pottery, hand-printed cloth, costumes from all over Russia and some ho-hum Soviet stuff). WALLS & TOWER. For a walk along part of the walls (Krepostnye steny), and a climb up the 18th century Kalichya Tower (Kalichya bashnya) for a good view over the monastery and town, take the passage between the art and history museums. More Sergiev-Posad pictures ( 40 pictures). 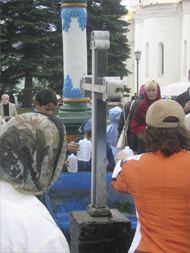 2006, September.